"It is generally accepted that the name of this gate derives from the tax-free wine that was sold inside the portal from 1554." - The Alhambra and Generalife in Focus, Translted by Jon Trout, Pub. by Edilux, 2008, p. 38. 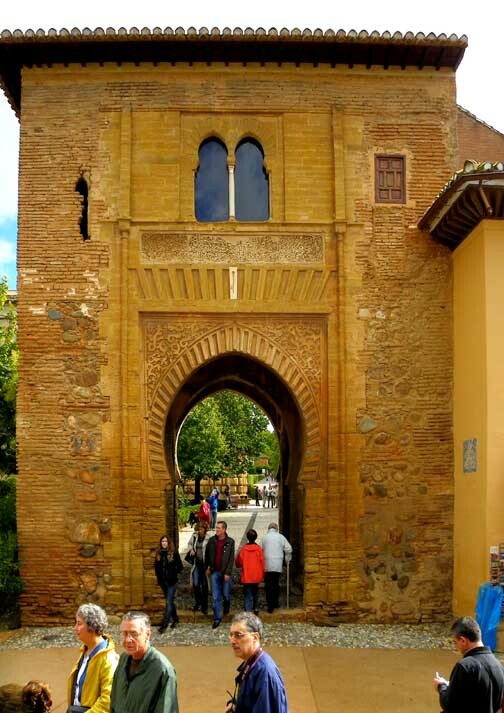 The exterior façade of the gate is the oldest part and it has a pointed horseshoe arch and embossed voussoirs. 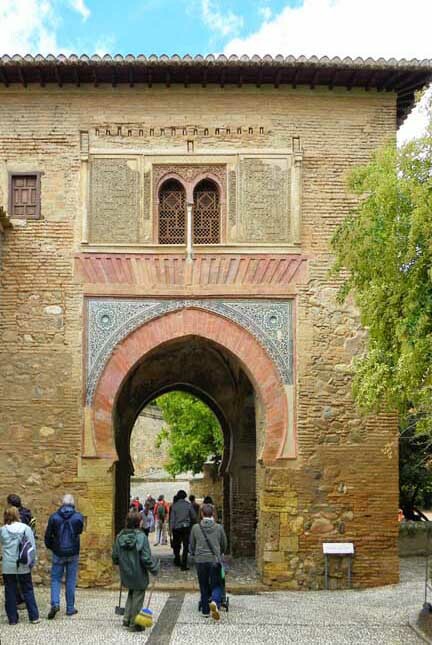 A symbol appears on its lintel: a key with a cord and a plasterboard [See second illustration below] with the following text: "Glory to our Master the Sultan Abu 'Abd Allah al-Gani Billah" (Mohammed V). On the back façade visitors may admire an arch with scallop with polychrome brick decoration. 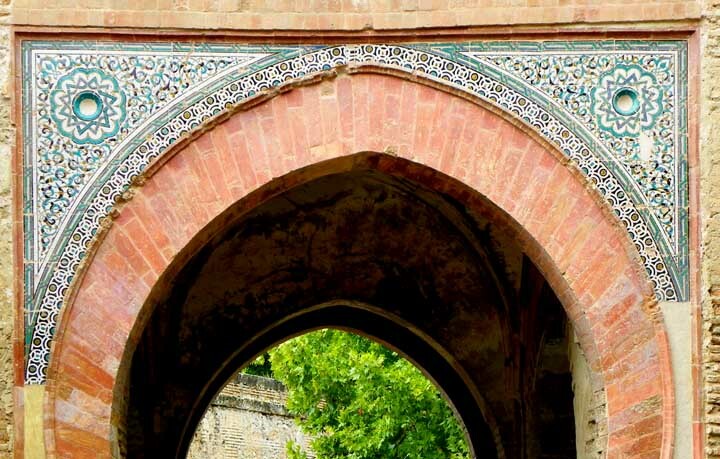 On the arch there is a lintel with voussoirs, which gives support to the second body... and on the crossing of its arch is the coat of arms of the Nasrid kings and the following text: "Only God is Victor." 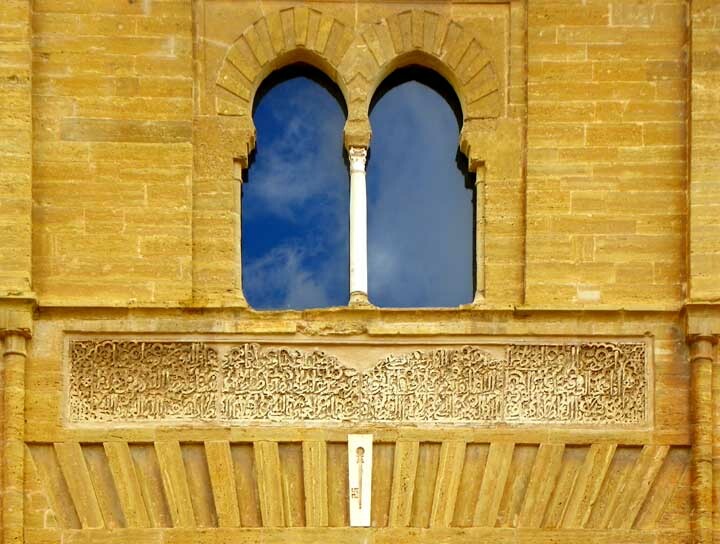 "The exterior façade of the gate is the oldest part and it has a pointed horseshoe arch and embossed voussoirs. " Panel decorated with stucco calligraphy. 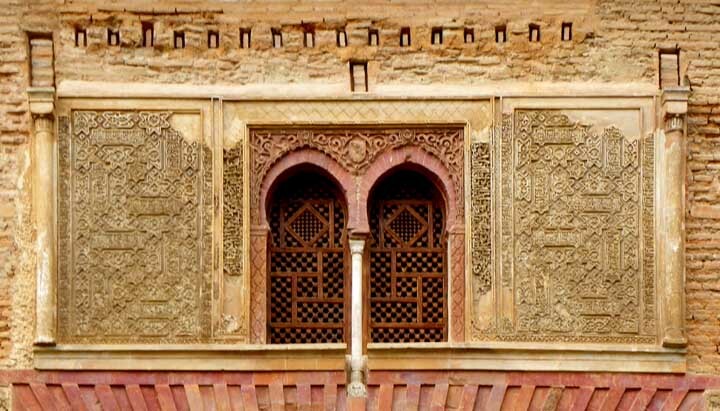 "Key with a cord and a plasterboard with the following text: 'Glory to our Master the Sultan Abu 'Abd Allah al-Gani Billah' (Mohammed V)"
Window with its jalousie (blind or shutter having adjustable horizontal slats for regulating the passage of air and light). "... on the crossing of its arch is the coat of arms of the Nasrid kings and the following text: 'Only God is Victor'." 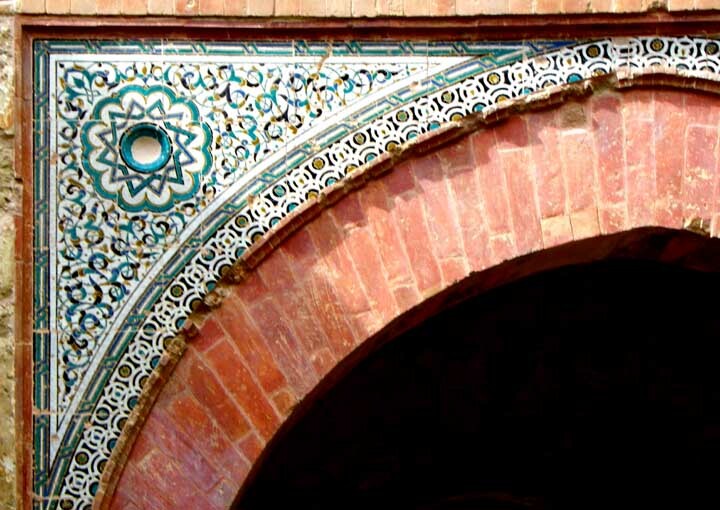 Spandrels are decorated with ceramic tiles with arabesque design. The angled bricks are voussoirs.